Romancing Europe – Coming Soon! The last time I was in Europe we were sailing on La Gitana. We came up the Red Sea, through the Suez canal, and stopped in Cyprus, Turkey, Greece, Malta, Spain, and the Baleraic Islands. I waved wistfully at Italy as we sailed by. We have to save something “for later, ” I consoled myself. We were on our way home then. We wanted to get there in time for our daughter to start High School, and to bring our son home, who had stayed behind in Australia with friends. 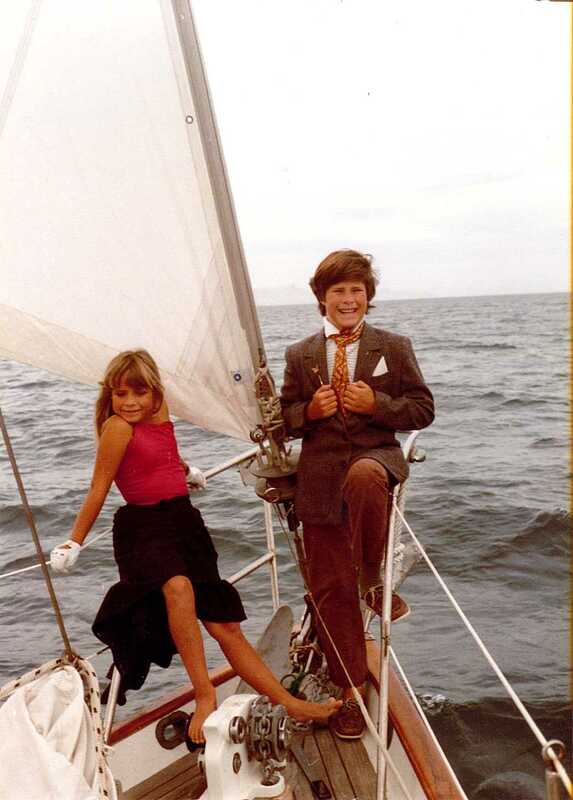 They were eight and eleven when we sailed away from Ventura Harbor six years earlier. Now, at long last I am returning to Europe, this time with cousins, one of whom won a grant to visit the castles of Europe to enrich her 4th grade classroom. Lucky kids. Lucky me! I get to tag along. We will be flying into Madrid and visiting Segovia and Barcelona as well, before heading on to Paris. From there we will take a train to Bruges, Belgium, then on to Frankfurt where we will rent a car to tour Germany and all the castles along the way. At Freiburg we’ll catch a train over the alps to enter Italy, at long last. From Milan we’ll head down to Lake Como and the Almafi Coast we had sailed by so long ago. We’ll spend several days there and on the island of Capri, before heading to Rome, and from there home again. A whirlwind romance in 30 days! For me, the highlights of the trip will be the art museums. To see some of my favorite artists’ paintings in person will be such a thrill. But the castles, the cathedrals, the cities, the hillside villages, the architecture, the history . . . all will be a close second. Sadly I will be missing all of Tuscany, including Florence, Vienna, and Venice. For an art lover, this will be a huge sacrifice. But I can’t complain. I’m thrilled to be going at all. Besides, I remind myself: I need to save something for “later.” Hopefully it won’t take this long to return. I don’t want my blog to go dark while I’m away, so I’ve pre-scheduled a few posts to cover the month I’m gone. That way I can keep in touch with all you lovelies through comments on my blog and on yours. I won’t be blogging about my trip until I return though. I promise not to turn this into a travelogue. A few photos from our last trip to Europe before I go. Ciao! In Marmaris, Turkey, with her friend, Sarah, another yachtie child living her parents’ dream. 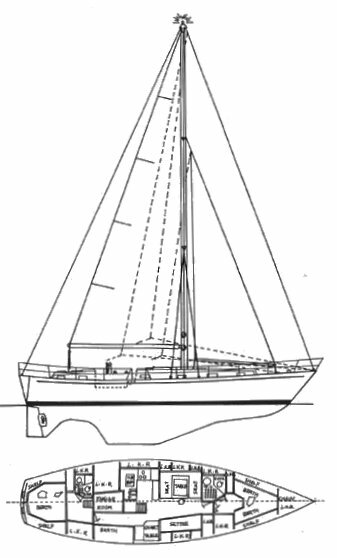 I was reading from some of my old sailing journals when I came across this entry. It captures so perfectly what it was like to be crossing oceans in a small sailboat with young children, that “wondrously strange” brew of the ordinary and extraordinary mixed together. 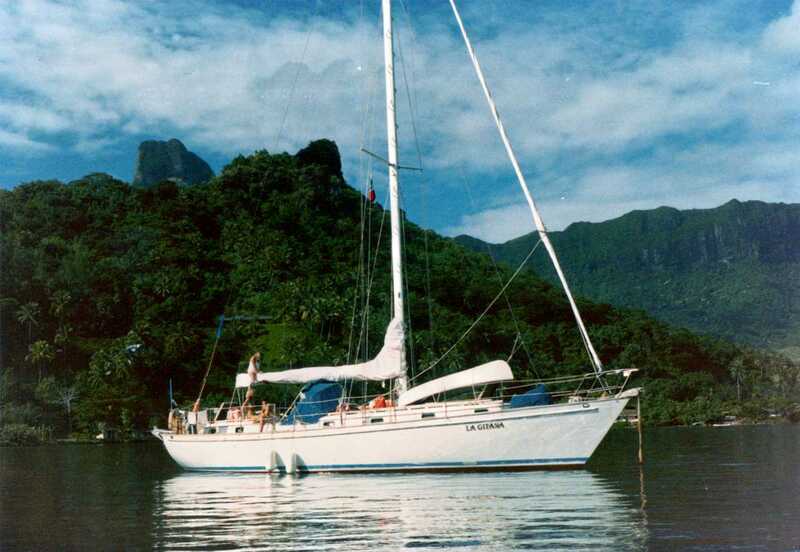 The photo is of our landfall at Nuka Hiva in the Marquesas Islands after a 28-day crossing from Mexico. But in the middle of the voyage we had no idea how long it would take or even if we would ever reach the islands. The fact that that mist shrouded green gem rose from the sea exactly where we thought it should rise seemed a miracle. We are flying wing to wing at 6 1/2 knots toward the Marquesas, at last. We’ve been at sea 16 days, since April 16, and are not yet to the half-way mark. Out of 2800 miles we still have 1560 to go. So far our crossing has been better (physically and mentally) than I imagined. We were all a little sea-sick our 2nd and 3rd day out but have been fine since. We try to live one day at a time (always a good idea) and not think about how long it might take us to reach our destination–especially now when a 40 day crossing seems likely. Our worst days (and nights) have been during the two rain storms we’ve had so far. The dampness and clamminess of everything is disheartening, and the black, wet night watches uncomfortable. The constant roll and pitch of the boat make the simplest task arduous. Brewing tea can become a chore of maddening dexterity and frustration. 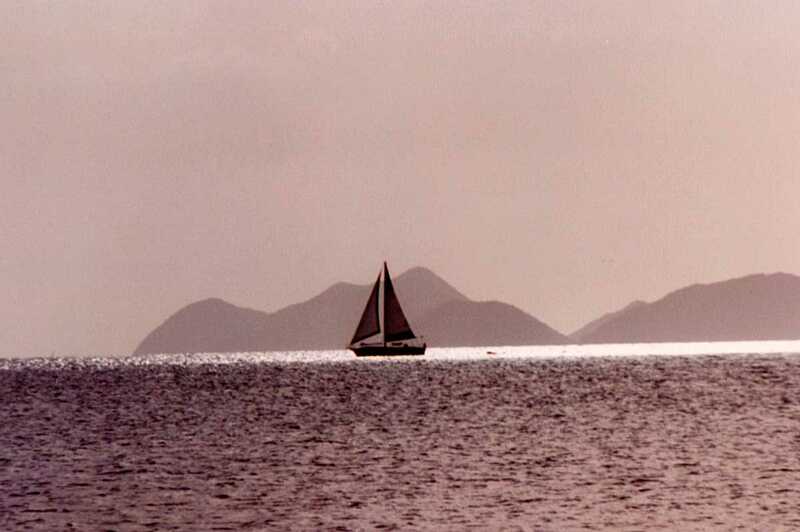 And yet in other ways, life goes on uninterrupted, unperturbed, as if we were still at anchor in San Carlos. 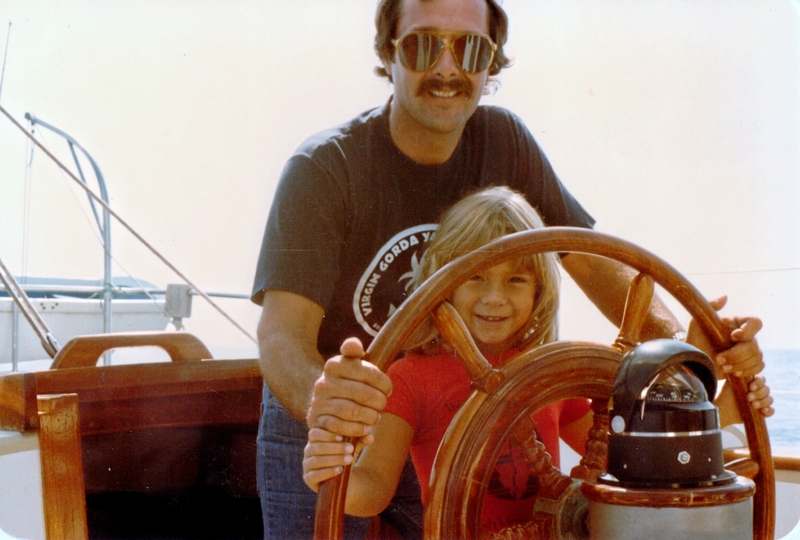 Sometimes I sit cuddled with Dale in the dark cockpit surrounded by a stream of sea and stars and marvel at the children’s voices drifting up from the galley, their light banter as they do their nightly dishes amid a dim circle of light. The only light in a thousand miles of darkness. Then it strikes me as wondrously strange, our few feet of ordinary human activity adrift upon an endless indifferent sea beneath an ocean of stars. The glassy surface of the ocean rose up creating a razor-sharp edge as it continuously slipped along beside us, like a wave that never breaks. Watching it, I thought, I never want to be anywhere but here. And, I never want to lose this. I sought to etch it in my mind so it would always be part of me. She seemed almost as alive to us as the other creatures that she cavorted with, the dolphins that played at her side, the whales that swam beneath and circled her, the flying fish that landed on her decks. Her spirit was all her own. But her breath, her pulse, her beating heart, her life blood, was us, the people who inhabited and cared for her, plotted her course, walked her decks, stroked her beams, and dreamed her dreams. 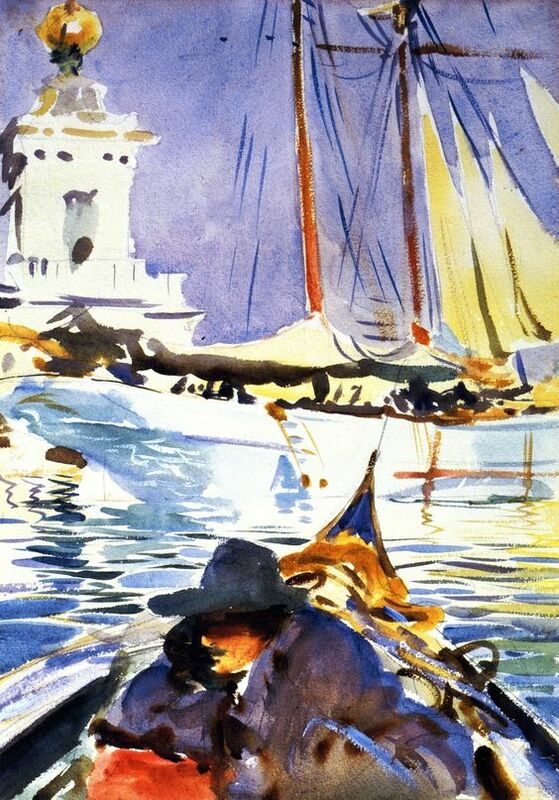 One of my favorite pastimes when we were sailing was watching the wake the boat made slipping through still waters. The glassy surface of the ocean rose up creating a razor-sharp edge as it continuously slipped along beside us, like a wave that never breaks. Not every wake was like this and so fascinated me. It came only under perfect conditions. When the sea was clear and still, smooth as a mirror. When the wind was non-existent or so light it was like a baby’s breath. 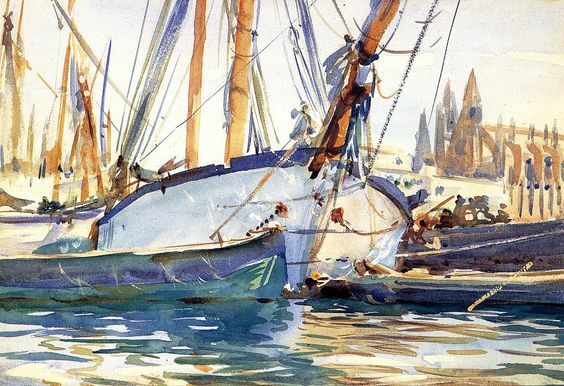 When we were sailing lightly on a zephyr’s breeze, or motoring through calm, still waters. When the wind rose and rolled, the wake would change, shot over with foam, its curl not so distinct, its edge not so transparent. I’ve searched everywhere for a photo of a wave or boat wake that captures what so fascinated me, but the closest I can find are images of sand dunes with that razor-sharp edge following the undulating line of its crest. 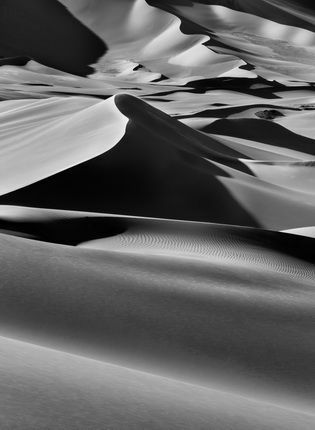 Sand dunes have their own haunting beauty and they too shift over time, but even so they don’t do my memory justice, for the wake I watched was alive, vibrant, constantly moving, a steady companion. It was sculpture in motion, the way it curled up continuously creating that sharp, transparent edge. A slight undulation along the lip as it held its form was mesmerizing. Watching it, I thought, I never want to be anywhere but here. And, I never want to lose this. I sought to etch it in my mind so it would always be part of me. Of course, it wasn’t just the sight of that never-ending curl, that razor-sharp edge trembling in the sunshine that moved me. It was the whole experience. The still sea stretching out forever, the soft swish of the hull parting the seas, the whisper of the wind against the sails. It was the tang of the salt in the air and the balmy breeze stroking my skin with silk gloves. It was me, bare-legs stretched out against the warm teak decking, sitting absolutely still in a sea of motion. 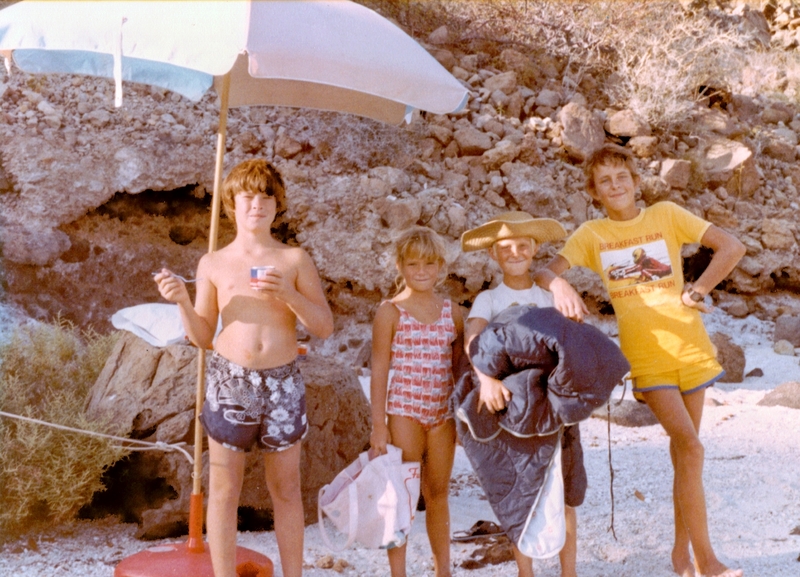 It was my family tucked away with me within our living, moving, breathing home, miles and miles from anywhere, safely embraced by the sea and sun and breeze. 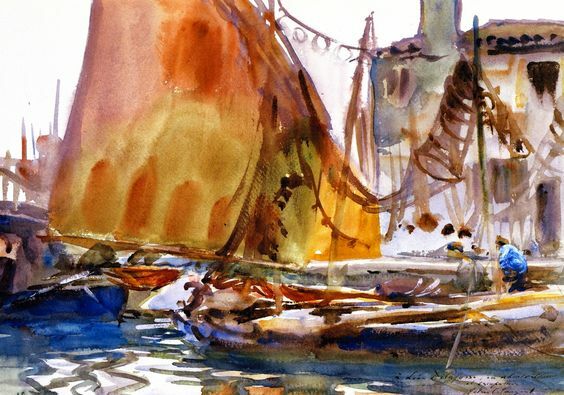 If anything clearly captures the essence of what it was like to live aboard La Gitana all those years, it was the poetry of moments like this, repeated over and over again, like glittering pearls strung along a string. I think now what fascinated me then was how this was such a clear example of the ever-changing changeless: The constant subtle variations in the wake’s shape that made it so mesmerizing to watch and yet changeless in its constancy, it never-ending formation. And while it lasted for hours, it was ever a new thing, newly created moment by moment. I wanted to reach out and touch that razor’s edge, but I knew if I did it would dissolve beneath my fingers. How could water, so malleable that it melts through your fingers, create such a sharp, clear edge and hold it so long? These things fascinated me then as they do now and fed my interest in the sublime ambiguities and paradoxes that underlie this beautiful world we live in. I began this blog five years ago, in July 2012. It’s been a wild ride, and I’ve loved every minute of it. My first post earned me one “like” and no comments, and now I have over 9000 followers, mostly due to being “Freshly Pressed” three times. When you start blogging it’s like tapping out a weak signal into a vast universe wondering if there’s anyone out there listening who will pick up and respond. You feel small and alone at first, but powerful too, like that first explorer setting out into the wilderness, not knowing what you will find there, if anything at all. And then you get your first ping back, a response. That’s all it takes. You’re not alone after all. Someone is listening, someone like you, and community of like-minded adventurers is formed. 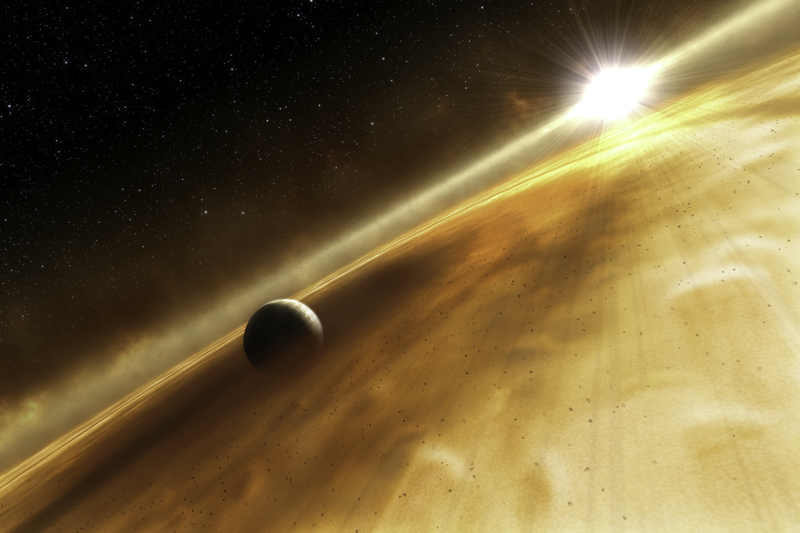 Your little spacecraft has a purpose, and a grounding (a following), as you zip through cyberspace exploring what’s out there. The purpose of this blog, as I wrote about in my first post , has not changed much, although the emphasis has shifted over time. “I created this blog to explore what it means to be living on the edge of the wild. We all are, in some way, living on the edge of the wild, either literally or figuratively, whether we know it or not. We all are standing at the edge of some great unknown, exploring what it means to be human in a more-than-human universe. We encounter the “wild” not only in the natural world, but in ourselves and our daily lives, if only in our own strange dreams, our own unruly minds and rebellious bodies, our own inscrutable families and weird and wonderful pets. 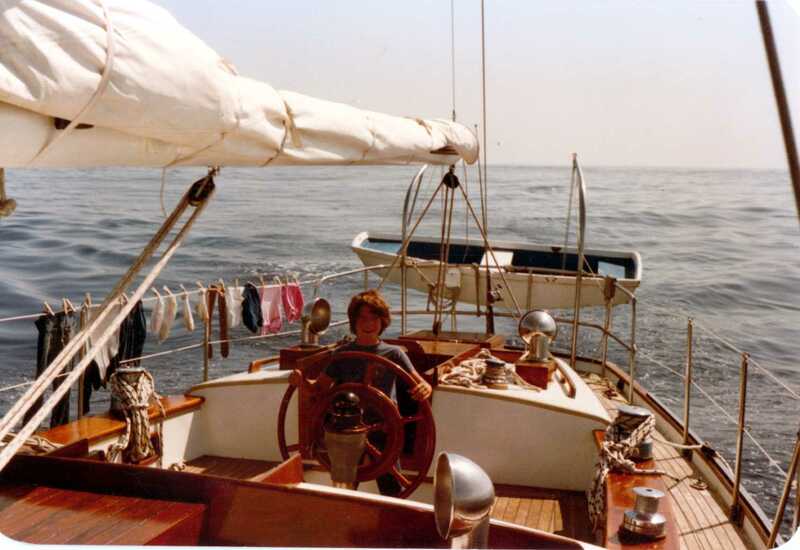 I started out with a series of “Sea Sagas” about when we went sailing around the world, most posts on the why and how of it, not getting very far in our journey, and I’d like to get back to that again. The wildest, bravest, and most romantic thing I’ve ever done was to fully embrace my boyfriend’s dream of sailing around the world and make it my own. In fact, I’m pretty sure that’s why I married him. I also wrote a lot about the art and craft of writing, and my own writing experience. The two-part series about writing with Annie Dillard is one of my and my followers’ favorites. The gap between appearance and reality; between what’s real and what’s not, and how we can ever truly know for sure. If it’s possible at all. The dark and the light, good and evil, beauty and brutality, the foolish and profound: how they play together, how they are all wound up in each other, how it’s almost impossible to tear them apart, as least in our ordinary, daily experiences. They lay side by side, or one on top of the other; they copulate over and over, and we, this life itself, is what they give birth to. The most horrifying sound I’ve ever heard came one night soon after we moved here. A scream of pure terror that seemed to last forever. A prose poem followed, based on my experiences caring for my mother when she was dying: 13 Ways of Looking at Dying, Just Before, and the Moment After. Another popular series of posts began with True Ghost Stories, Part One, Growing up in a Haunted House. One of the most popular in that series was about A Demon Sitting on My Chest. The series ends with me questioning whether all I experienced was “really” real, and evoking the voice of one of my favorite GOT characters. So are the ghosts, demons, and other supernatural beings that have haunted humans through the centuries, that make brief appearances and then disappear, “real”? I do not know, and I’m not sure if it even matters. They are real enough to those that experience them, as least while they are experiencing them, and then afterwards, one wonders. Each of us makes but brief ghostly appearances in this world we call real. We apparently spring from nearly nothing–a few multiplying cells, and then disappear into nothing as our bodies disintegrate after a short visitation that can last a few days or a few decades. Are we “real”? “You know nothing, Jon Snow!” So claims the wilding Ygritte in the Game of Thrones series, a saying that has become a popular catchphrase for fans. And rightly so, I believe. It has the ring of truth about it. Author George R. R. Martin created a soft-edged, constantly evolving world that surprises and delights and dismays us at every turn. And if we become too comfortable in believing we know who the good guys and bad guys are, or who has power and who is powerless, what is real and what is not real, we are sure to have it turn topsy-turvy in no time at all. It is a world that feels very much like our own, psychologically, emotionally, if we would only admit it. Perhaps we are all Jon Snows, grasping to know for certain, what can only be known tentatively at best. And this is true when considering the limits of our own private, personal lives, as it is when considering the Big Questions about Life and Death and Reality. So when people ask me now if I believe all this stuff I’ve written about in this series of ghost stories, I can hear Ygritte’s mocking voice challenge me: “You know nothing, Jon Snow!” And I wisely keep mum. 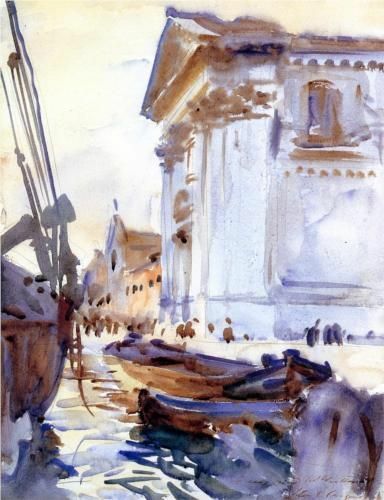 But lately my posts have been more about exploring the world of art, and my adventures playing with watercolor, than about writing or exploring the darker corners of consciousness. I don’t know where this little blog-craft will take me next, and that’s the fun of it, that not-knowing: The mystery that lies beyond the edge of the wild and beckons us onward. Thank you for taking this ride with me, for reading and responding, and for allowing me to be part of your lives as I follow you on your adventures. The first poem I shared on my new blog five years ago was scribbled in the starlight on a moonless night while crossing the Sea of Cortez. A few months later I received an email from Troy Armstrong, a classical composer who said he had set my poem to music to be performed by a choir. As I listened to the music, tears were streaming down my cheeks, for I knew this is what I would have heard that night had I ears to hear, sailing among the stars. Poetry, as well as music, has the power to capture that state of wonder we all feel at times when confronting the beauty and majesty of nature, and its power to move us beyond ourselves. In celebration of National Poetry Month, I’m sharing the original post below with the poem and a link to the music. 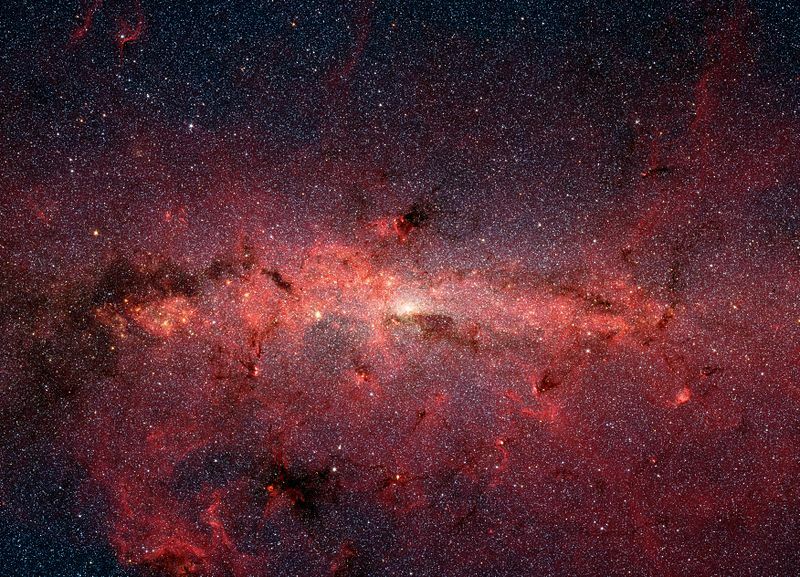 Like a world spun out of space. 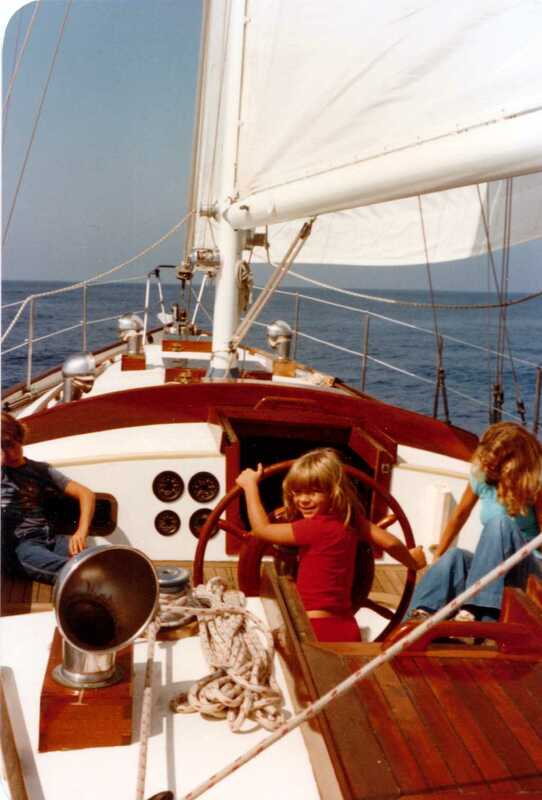 This post is a continuation of the article I wrote about long-distance sailing with children that I wrote long ago as we embarked upon what would be a 6 ½ year voyage around the world. Read Part I, HERE. So amid tears and protests, we moved aboard “La Gitana” where she lay patiently at her slip in Ventura, California. There Dale and I gave up the roomy aft cabin to the children with their collections of stuffed animals, Barbie dolls and Star War Empires. Then we settled back to await the inevitable bouts of tears and sulkiness that must accompany this new adjustment period in our lives. But it never happened. 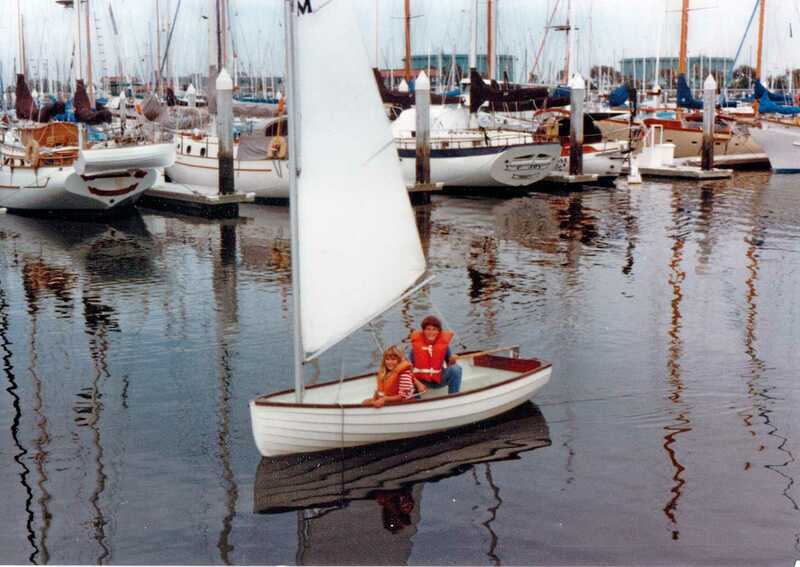 Chris was too busy learning to sail our dinghy, while Kelli was totally enchanted with her new, tiny inflatable and happily rowing off backwards to visit new-found friends living at the marina. Soon surfing and boogie boarding became the favored past-time, and the children were heaving boards to heads and going off to explore the waves together. 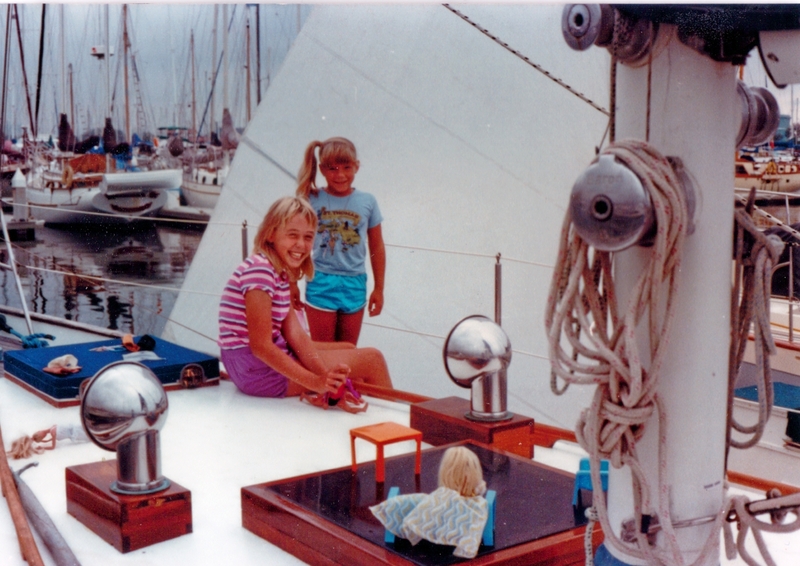 By the time January and our much delayed departure date rolled around, the children had made new lives and new friends for themselves at the marina. But there were no tears at departing this time–they were as ready to head out as we were. 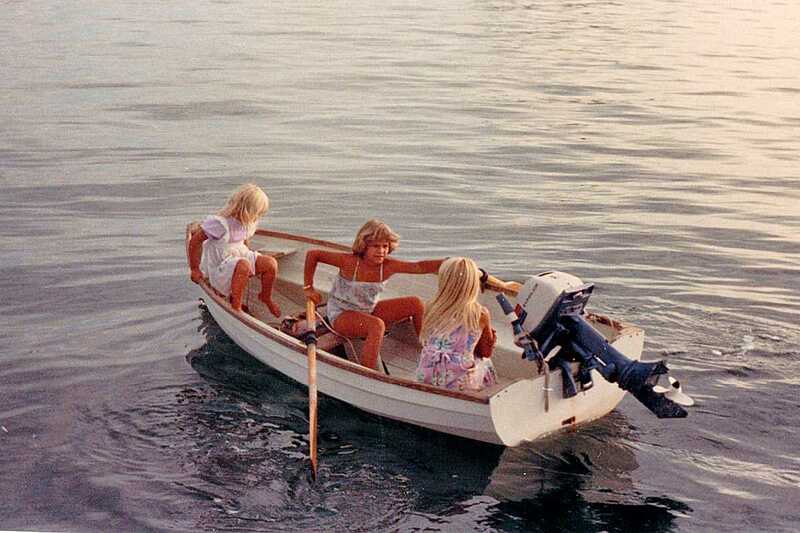 Already they had learned that they could adapt to a new environment and make their own places in it, wherever that place might be.This easy acceptance of and adjustment to the cruising life continued. We spent two delightful weeks at Catalina Island before heading further south. 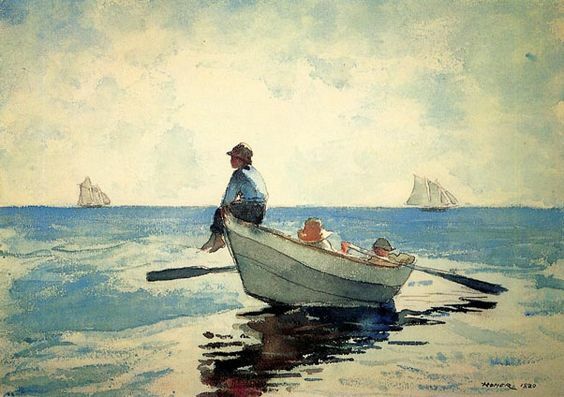 Even in that short time, the children’s sense of independence and self-reliance increased as they rowed themselves ashore each day to explore the little town of Avalon by themselves or took their places at the fishing dock among all the old-timers there. Chris became so adept at working the oars of our ten-foot dingy that he became the family’s official rower. Whenever the four of us went to shore together, it was his strong back and broad smile that transported us there. I’ll never forget one twilit evening when Kelli offered to row the trash ashore, and, despite my doubts, Dale said she could handle it. 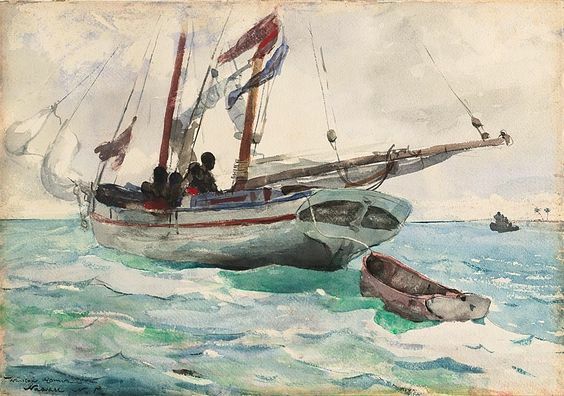 I watched, trans-fixed, as my little eight-year-old daughter heft the large bag into our ten-foot dingy, untied the painter and shoved off, manning the heavy wooden oars that I myself had trouble with. She rowed, not backwards this time, but like a good seaman with her back to the future as the gathering twilight slowly hid her from view. Kelli won more than a bit of independence that day–she won respect and admiration, for she rowed a straighter course than I could. 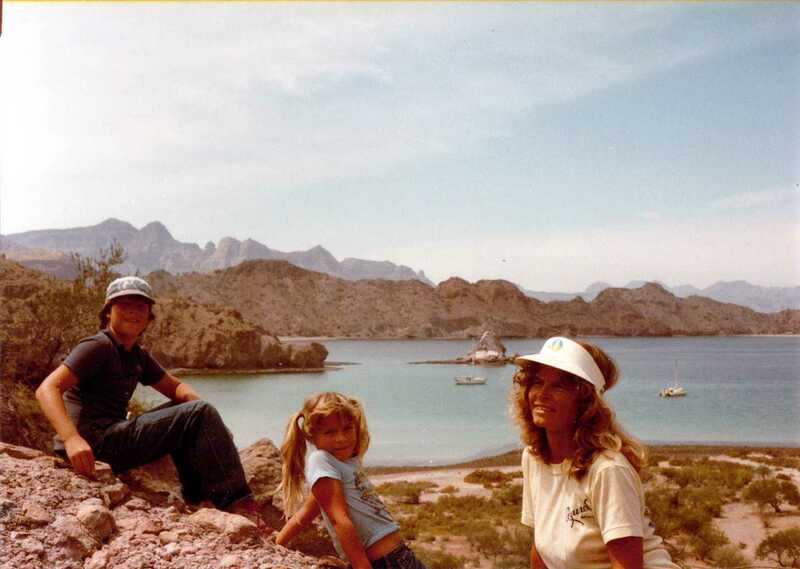 By the time we reached Cabo San Lucas and rounded the tip of Baja into the Sea of Cortez, we had discovered that many of the more trivial concerns that, nonetheless, loomed so large in our minds had disappeared. Now it’s hard to imagine why we once thought that lack of privacy or cramped quarters would become a problem. Our forty-six foot Formosa with its large center cockpit and forward and aft cabins has provided us with all the privacy and living space that we seem to need. We live as peaceably here as we did in our house and perhaps more so. Not only are our cramped quarters not a problem, but they have often proved a blessing. Now when the children bring the Legos out to the salon table to build spaceships, Dale or I are often drawn into the creative enterprise. And it is easy to supervise school lessons from the galley while in the midst of kneading sourdough or canning chicken. Then, when we do need that time to “be by ourselves,” we’ve found that cooperation rather than space is the prime factor. And cooperation is readily available. Why we once thought otherwise seems a mystery now. The simple luxuries of a daily shower, a washing machine and TV are no longer missed. While the privacy of a good, hot shower is still a luxury that we would readily welcome, we’ve found that it’s only just that–a luxury, not a necessity. Its absence does not affect the quality of life or well-being in the least. Fresh water sponge baths and sea-bucket showers are enough to keep us feeling as fresh and clean as the humidity permits. 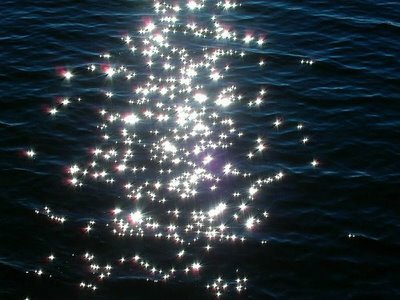 Then, when we are in a port where fresh water is plentiful, nothing compares with a fresh-water sun shower during the heat of day or within the warm caress of a starry night. I’ve discovered that washing laundry in buckets of salt water and rinsing them in fresh keeps our clothes as clean and soft as they need to be. It is not the drudgery that I had anticipated. At the house, doing laundry for me was always a rather tedious task performed alone in the semi-gloom of our garage. 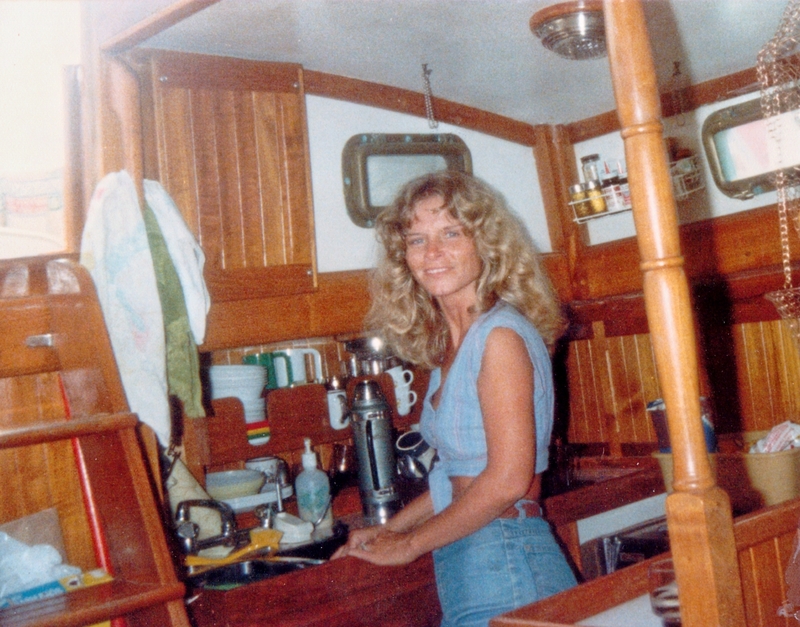 Now I do the laundry in a bikini on the bow of the boat with the brilliant sunshine and wind refreshing my spirits while panoramic views of busy harbors or lovely anchorages enchant my mind. And never am I a lone. There is always Chris to haul up buckets of water for me, Dale to help rinse and wring, and Kelli to hang the clothes on the life lines. The absence of TV has been one of our greatest blessings. It opened the fascinating world of books to our children who, until we began cruising, seldom read. We were only a week into our cruise when Chris, quickly drying the last of the dishes so I could begin our nightly reading session of The Hobbit, exclaimed, “This beats watching TV any day!” And this from a boy who had suffered the cruelest deprivation of his life only months before when we cut the cable to MTV. Since we’ve been cruising, I’ve ceased to worry about depriving the children of their involvement in organized sports and clubs. We’ve found that this life at sea provides ample opportunities for developing skills, independence and self-reliance that more than compensate for that lack. These cruising activities seem to be more holistic in scope, as well, encompassing many aspects of a single theme. 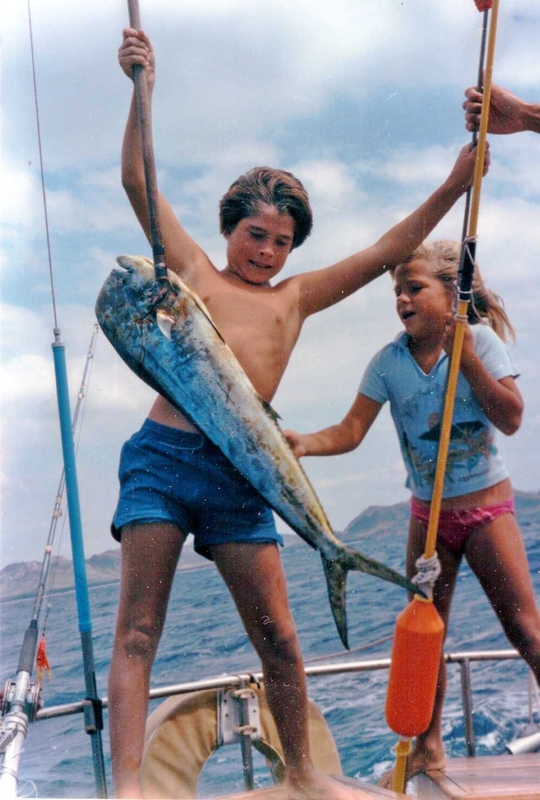 Fishing, for example, has become a favored past-time for the children, but this passion involves far more than casting a line into the sea. Each child catches and salts down his own bait, rigs and cares for his own poles, then cleans and fillets his own catch. They both spend many enjoyable hours making lures out of feathers, bits of colored string, and other odds and ends. Chris, especially, actively seeks out and devours any articles or books on the sport of fishing that he can find, and he spends hours pouring through our charts and cruising guides, looking for the best fishing and diving spots. Our fish identification book has been worn to tatters by constant perusal. Now, when I am puzzled by the identity of an unfamiliar fish, I have only to describe it to the kids to find my answer. Even the children’s artwork nowadays includes many finely detailed and colored drawings of the fish they admire. 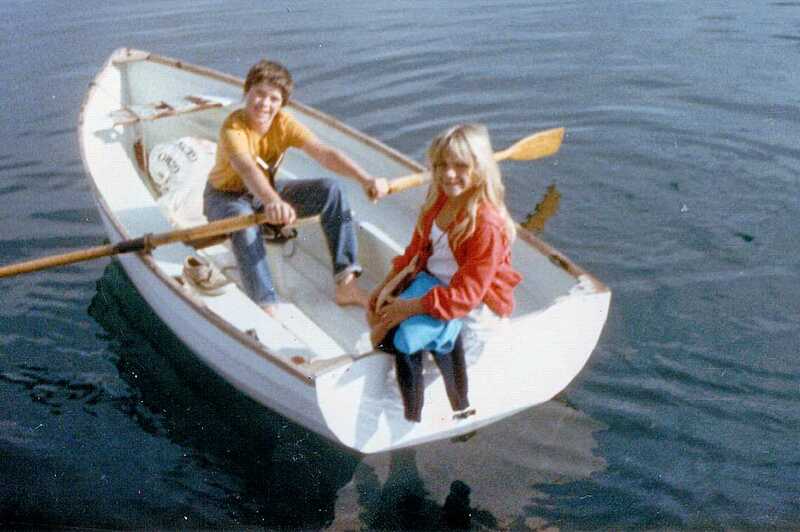 In cruising, we’ve found that many of the skills that the children learn provide as much practical use as they do play, Rowing, sailing, and working the out¬board motor are not only fun but are the children’s main means of transportation to and from shore. 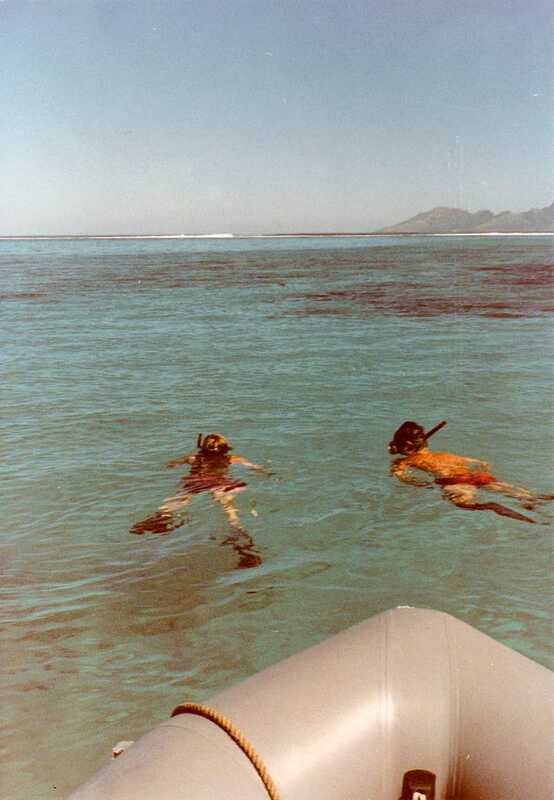 Swimming, snorkeling, and diving provide excellent recreation as well as dinner. 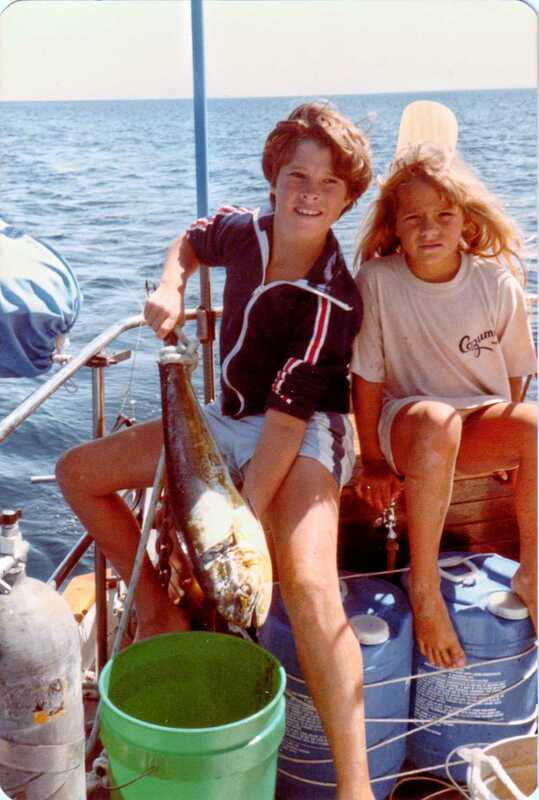 Chris has become quite proficient at hunting and spearing fish and lobster, often free-diving to thirty feet to stalk a grouper or free an anchor. Kelli’s snorkeling and diving produces clams and scallops for supper, as well as a myriad of pretty shells for creating jewelry. A cruising life does provide less opportunity for the children to play with their own peers, but even this lack does have its compensations. The children have been forced to seek companionship in unexpected places, including each other. Their many expeditions to shore to explore the beaches and towns together has fostered a growing sense of responsibility, cooperation, protectiveness and con¬sideration between the two. It is often commented on how close they seem to be–comments rarely merited in the highly separate lives they led ashore. In addition, both children have become quite adept at striking up friendships with many of the adults they meet. These adults have included not only other cruisers or vacationing Americans, but many of the local Mexicans as well. Some of these friendships have become very special .and lasting, while others have led to some unique experiences. The children’s increasing command of Spanish has allowed them to become friends with some of the Mexican shopkeepers and fishermen and their children. In the process, the children have waited on tables, made signs in English, and helped out their friends in other small ways, as well as enjoyed several tours of local commercial fishing boats. One special friendship with a young American couple working down here led Chris to work and pay for his own diving instructions, allowing him to become a certified scuba diver at the age of twelve. 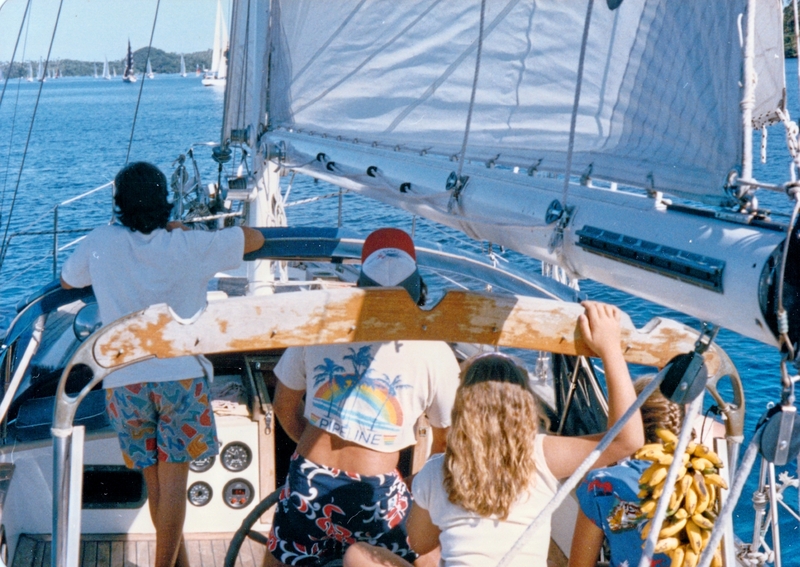 When the children do happen to come into contact with other cruising children, these friendships tend to be swift and deep, bonded as they are by their shared, unique experiences. They are learning that friendships need not be limited to one’s own peer group or even to one’s own nationality but are to be nurtured and savored wherever they are found. 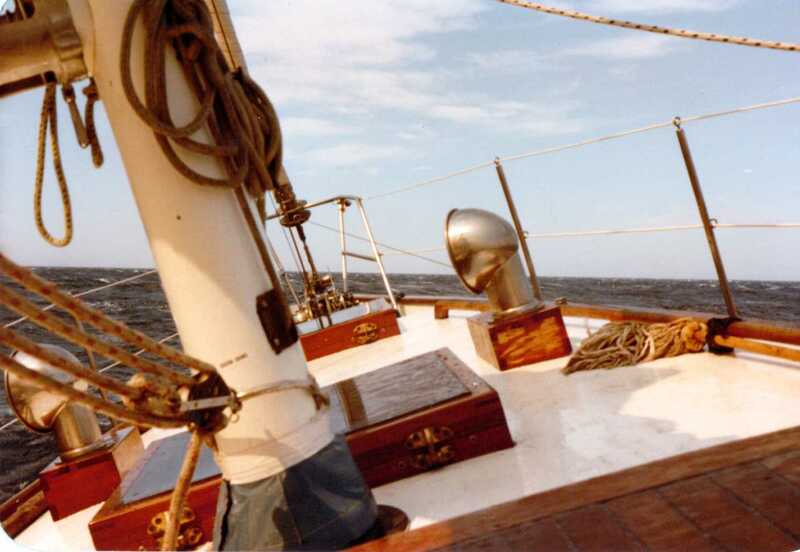 It is not only the play and pleasures, however, that are shared aboard a cruising boat, but the work, the responsibilities, and the learning as well. 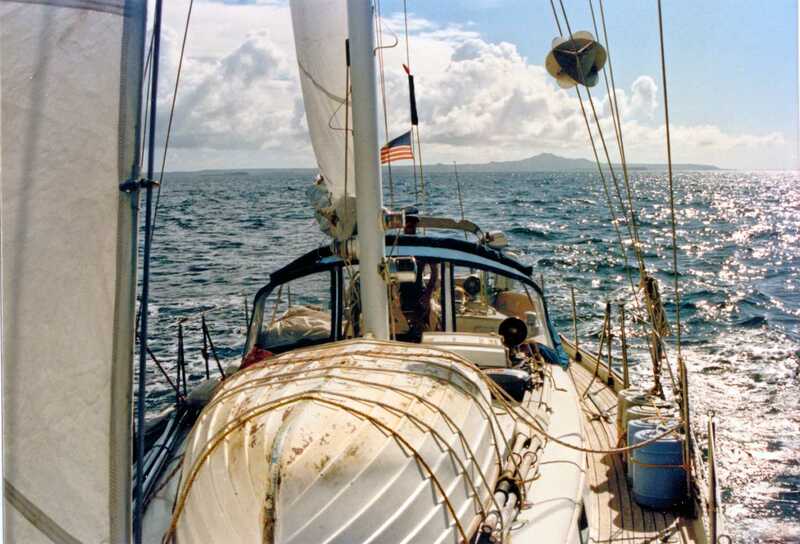 Aboard “La Gitana,” all the water and fuel hauling, the grocery shopping, the laundering and cooking, mending and sewing, and the bottom cleaning are joint activities, shared by all to some degree. Chris and Kelli are a great help when it comes to sailing the boat. They handle much of the foredeck work as well as much of the anchoring now. School, however, is our most challenging responsibility. I have been very pleased with the quality and content of the Calvert correspondence lessons, but it has taken some time for all of us to adjust to the children-as-pupils and mother-as-teacher relationship. Having taught school a bit in the past, I had no qualms about teaching my own children. However, I have since discovered that there is an emotional bond, or perhaps tension, between mothers and their children that does not exist in the normal classroom and does not facilitate the learning process. It seems to make the goofing off and the squabbling, the stricter expectations and shorter tempers all the more prevalent. The children somehow feel much freer to criticize their own mother’s teaching standards and techniques than they ever did their former teachers. I, in turn, find my own children’s sloppy work habits and inattentiveness much more exasperating than I did with my former students. Even normal shipboard activities seem to confound our best efforts as Dale tears apart the salon looking for some tool while working on one of his own projects, or friendly neighbors row by for a chat. 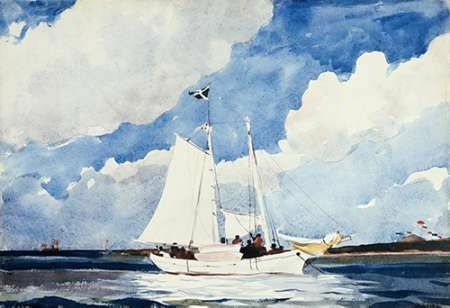 Underway there is always a herd of dolphin, a caught fish or a call to tack to upset our lessons. And yet, I keep reminding myself, isn’t this what we imagined maritime cruising to be all about–pitting ourselves against the unknown challenges in the world, in each other, and in ourselves, grappling with it and coming out the better? And so, we’ve grappled with our schooling these past two years, and, in fact, have seemed to come out the better for it. School is now a much more orderly process. The disruptions still occur, but we’re learning when to be firm and when to be flexible. The children are learning to accept my higher standards, and I am learning to handle the highs and lows of teaching them with more equilibrium. The satisfaction of personally supervising their studies and watching each child struggle with and acquire new skills and concepts now outweighs the moments of temper and frustration. Dale and I feel, more than ever, that the children are receiving a better, more comprehensive, more individualized education than they ever would have received ashore. And, in the process, our own basic education is getting a thorough review. It’s a learning experience shared by all. We have been cruising aboard “La Gitana” for over two years now, and not one of us would trade this life for our life ashore. Not all of it has been pleasant. I haven’t mentioned the time our drinking water turned a gunky brown and all of us were sick flat on our backs for a week, or the time I heard a bump in the night and looked out the porthole to see a huge shrimper looming over our bow, or the time I set the kids’ bunk cushions ablaze while trying to dry them with the portable heater. Then there was the time I dropped the thermometer and the mercury rolled into the 45 gallon water tank that Dale had just cleaned and refilled, and the time our kitten swallowed some bait attached to a fish-hook, and in her excitement jumped overboard and had to be reeled in on the pole. And there have been other times like these, including the common drudgery of hauling water, cleaning fuel tanks and scraping the boat’s bottom. But what life is without these “times”? To me, one of the magical things about cruising is this meshing of the ordinary with the extraordinary, the dreadful with the delightful. This life, we’ve discovered, is not an extended vacation, an action-packed adventure, nor an escape from reality. It’s neither dream nor nightmare but simply a way of life—of living from day to day—that we find very satisfying. All of the doubts that plagued me before our cruise began have now been thoroughly tested and dispelled–at least for the time being. I’ve learned that this cruising life can be all the things that we dreamed it to be, and more, and sometimes less. In fact, it’s a wonderful life; but this one, like any other, has its great unknown–and that’s the magic of it. 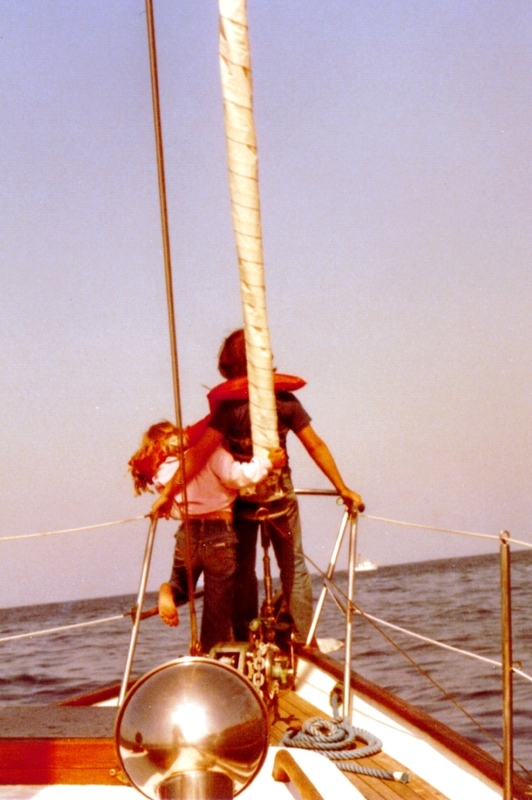 Sea Saga, Part VI — Cruising with Kids, Dream or Nightmare? The following is an article published in Latitude 38 many years ago. I’m reprinting it here as part of our Sea Saga series, about our six and a half year circumnavigation aboard our sailboat. The article will be posted in two parts. This is the first. “I thought it was only a dream!” she cried, then burst into tears. It was “only a dream”–a dream-come-true for Dale and me. But for our children, it may have seemed more of a nightmare as they watched the bits and pieces of their lives being hauled away by strangers. 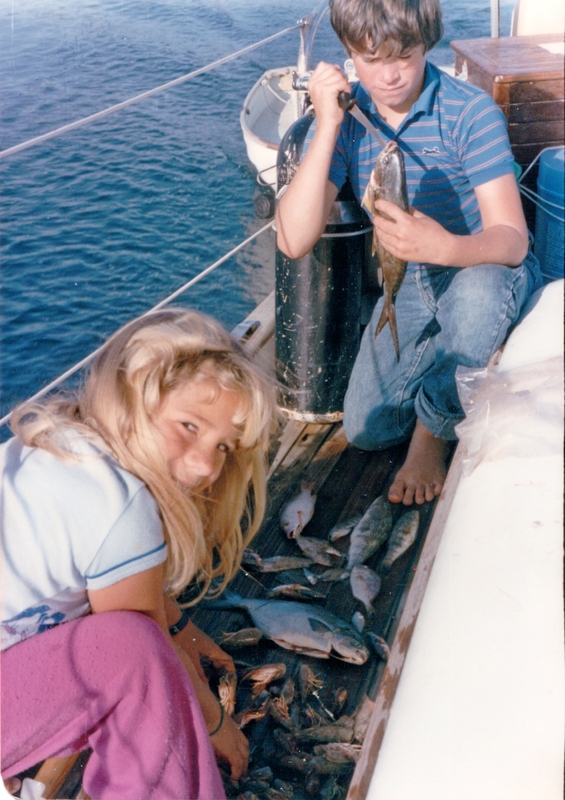 A year of patiently hand-feeding them tales of sailing off to tropical isles where they could swim, snorkel, and fish every day was rapidly losing its influence. When tasted with the very bitter sacrifices that were being required of them, such tales did not seem so sweet. Our decision to go cruising had not been a sudden one. The idea had been playing in the backs of our minds since we were first married. 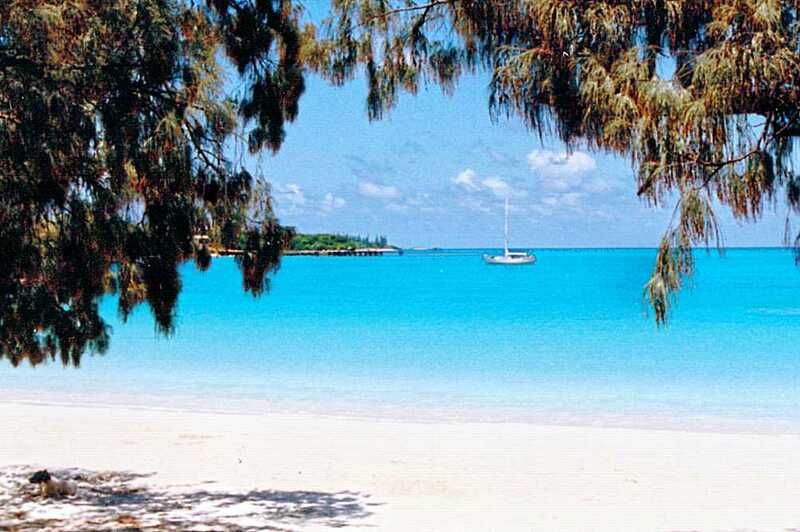 We decided then that “someday” when the children were the “right” ages, when we were financially able to leave on an open-ended cruise without the need of returning to a work-day world any time soon, we would leave for the South Pacific. 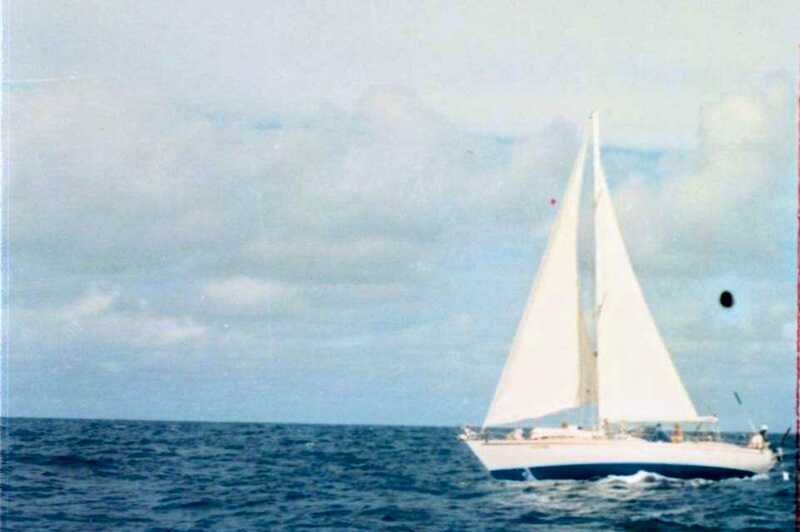 Ultimately, our dream was to sail around the world. But it took an idyllic bareboat charter in the Caribbean some ten years later to finally budge that dream into reality. 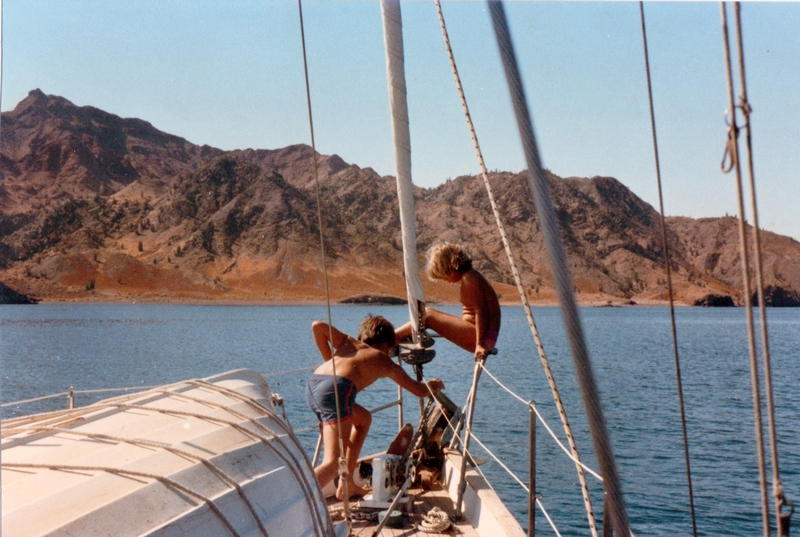 We realized that our children, then seven and ten, were the perfect ages for living aboard a boat. And with a little reshuffling of the financial deck and a lot of belt-tightening, we could just about squeeze by on that open-ended clause. After all, if we didn’t go now, when would we? We could wait until the children were grown, but how could we deprive them of such an adventure? And who could wait that long anyway? 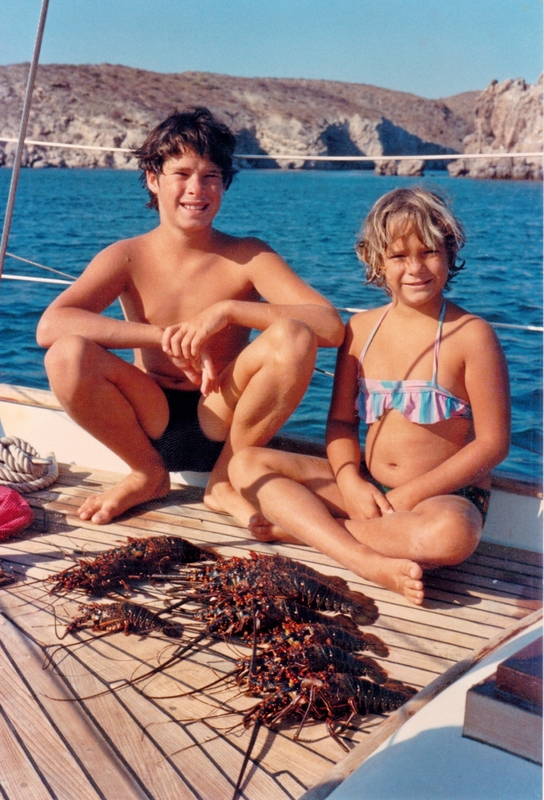 Dale and I spent many happy hours convincing ourselves that what we would be offering the children in a life at sea would more than compensate for the things that they would be giving up. We thought of the wonderful experience of traveling, the great cultural and environmental education, the challenges and opportunities for self-development. It all sounded so good, so true, and yet, a perverse thought kept plaguing me: Was it perhaps “too good to be true”? I began to consider the darker side of life at sea. Simply moving aboard a boat and sailing off into the world was going to require some drastic changes in lifestyle quite apart from the obvious benefits. The mere logistics of gathering the four corners of our large house and fitting it within the space the size of our family room alone required some creative mental maneuvering. Trying to envision some semblance of tranquility and order within such a jumble seemed beyond the stretch of my imagination. Could the four of us truly be happy living together in such close quarters? Wouldn’t the lack of space and privacy release hidden demons within us that would turn our cruising dream into a nightmare? Even simple luxuries took on new ominous dimensions as I tried to mentally delete them from the frugal lifestyle we were contemplating. While it seemed we ought to be able to live happily ever after without the benefits of hot showers, a cold fridge, a washing machine and TV–what if we couldn’t? Who knew what trivial monkey-wrench could throw the whole dream askew? 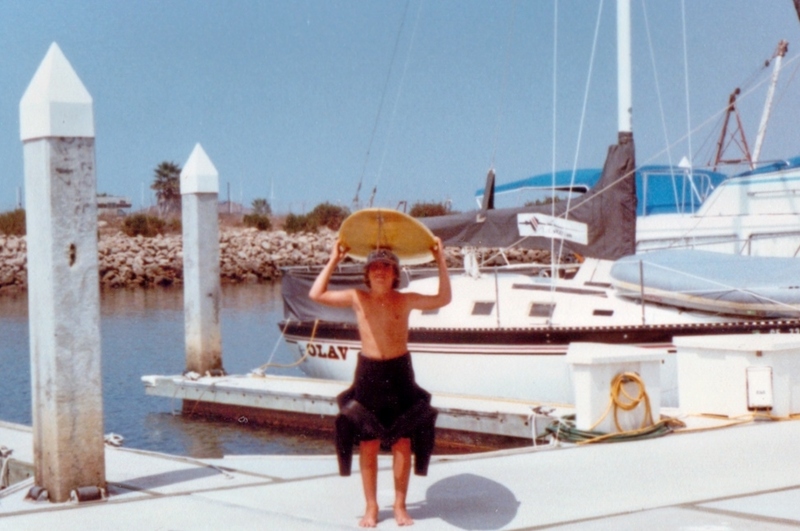 One of my secret fears was that we might all become extremely bored with our cruising life. I tried imagining day after day, week after week of nothing but bright skies, warm seas and white sand, and found the effort becoming tedious. 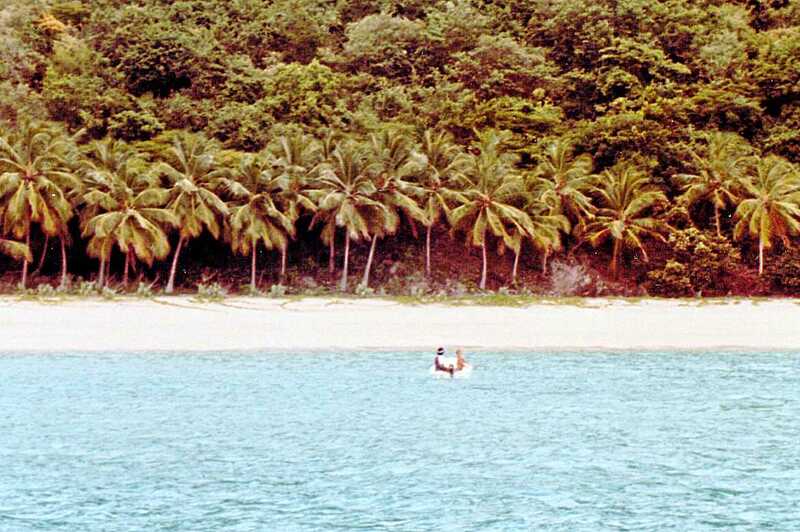 After all, just how much swimming, fishing and snorkeling could one endure? Even heaven could become tedious after a while—couldn’t it? Most of our worries centered on the children. Chief among these, and certainly the one most on the minds of the grandparents, was the question of safety. Were Dale and I being irresponsible in taking the kids off into the unknown danger that seemed integral in such long-distance cruising? Who knew what deadly storms or hurricanes, shark and appendicitis attacks, pirates or revolutionaries we would be exposing them to? Then there were their social lives to consider. Our children never seemed so happy as when they had hordes of kids to play with. Surely it was grossly unfair of us to deprive them of their peers and of the opportunities and enjoyment that organized sports and recreations offered. Often, I would find myself closely watching my two children as they moved about their daily activities–the very activities of which we would soon be depriving them. Christopher, at eleven, was fully enmeshed in that preadolescent social scene of soccer and baseball, skate boarding and video-games. It was a life-style in which he felt quite comfortable, and even while Dale and I felt that the life we were offering him was better, the question remained: Would he think so, say ten years down the line? Or would he feel cheated of the normal activities of adolescence? 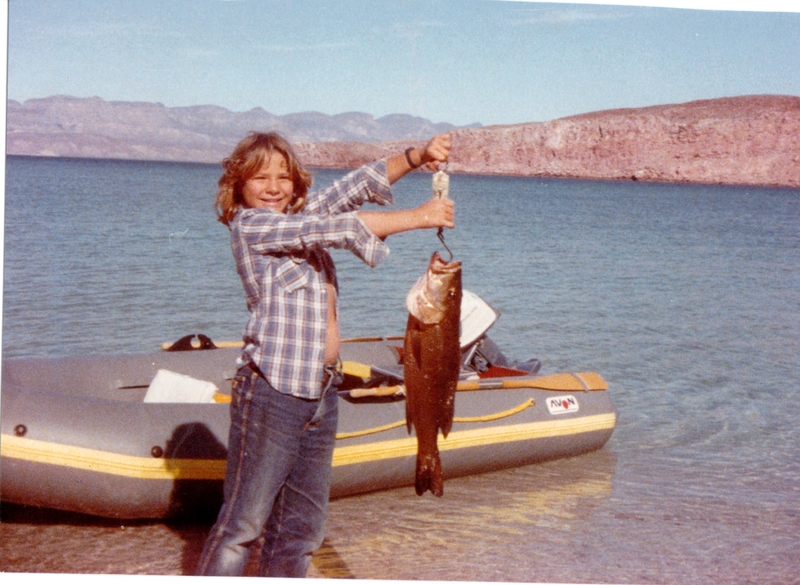 At eight years old, Kelli’s life was so much simpler, and yet such simplicity seemed all the more wretched to deprive her: doll houses and baby cribs, roller skates and her first two-wheel bike, gymnastic classes and tap dance lessons. Was she a budding ballerina whose career was being cut to the quick? What other new talents and skills would be left unplumbed as we dragged her away from future softball games, piano lessons and Girl Scout activities? Really, just how much were we truly asking our children to give up in order to accommodate our dream? With Kelli’s tears that bright June morning, all of these questions and doubts came bubbling back to the surface, bringing into sharp focus our quandary: would this cruising life that Dale and I so clearly envisioned reach in reality the expectation of our dreams; or would it fray somehow and wear thin under the wear and tear of everyday living, dissolving into the nightmare our children half-expected? The trouble was that we would never know until we had lived it. And to Dale and me, regardless the outcome, this life we so clearly envisioned seemed worth the effort and the risk. We had this singular opportunity to draw together as a family and pit our strengths, our skills, and our spirits against an unknown life and, just perhaps, come out the better for it. It was a chance we could not pass up. 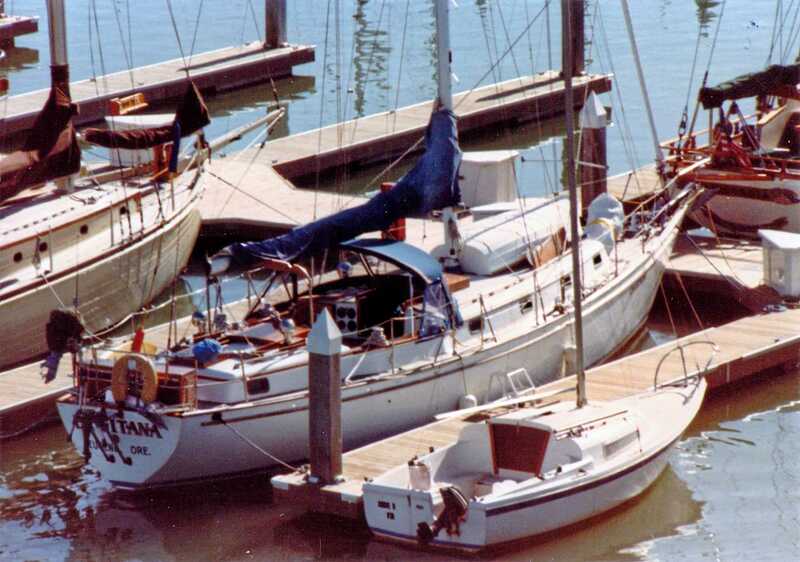 We named her “La Gitana,” Spanish for the gypsy, partly in tribute to our family’s Spanish heritage, partly because sea gypsies are what we would be once we moved aboard her and sailed away, partly for my long fascination with everything pertaining to Gypsies. I loved the music, the dancing, the clothing, the jewelry, the colorful furnishings of the caravans. 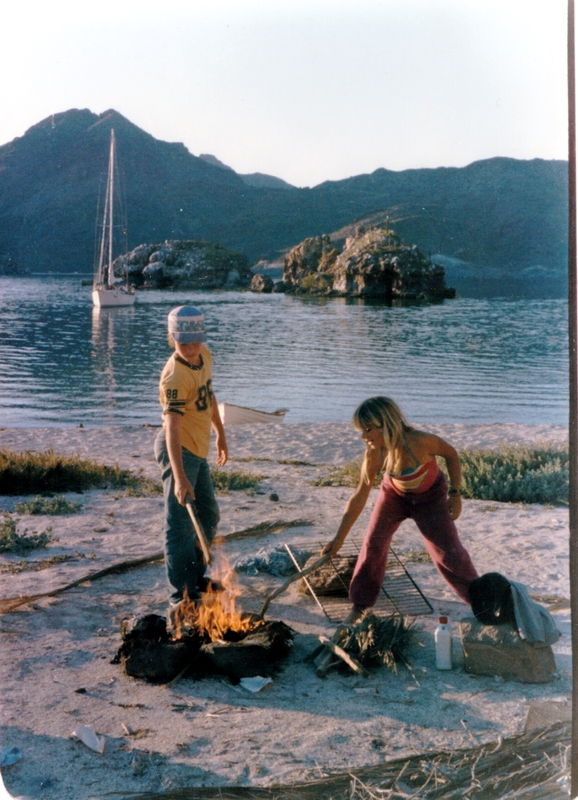 I loved what they stood for, the capriciousness of their existence living on the edge of society, their adventuresome spirit, their playfulness and spontaneity, their wildness—all the things we grew up thinking of as gypsy-like. La Gitana symbolized all of that for us. We feminized the masculine gitano and added the lyrical signifier “la” for alliteration, and to show her singular importance. The, not a. Of course she had to be feminine—all ships traditionally are. They are vessels that serve us, that carry us in her belly, under her wings. Her sails are softly rounded breasts bravely and proudly pulling us onward. And she was alive! So lively with a personality and purpose all her own—a creature, not a thing. It was a symbiotic relationship. We trusted her and sank everything we had into her. 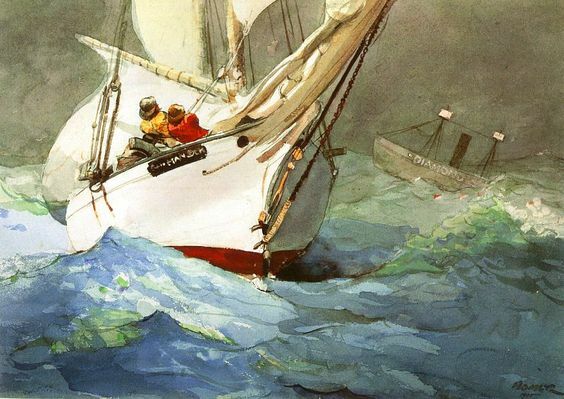 And she depended upon us to steer her away from the harbor and allow her to run with the wind, to lead her to a safe haven and hunker her down when the hurricane blew. Originally she was called “Swagman,” which is what peddlers and tinkers are called Down Under. We bought her from an Aussie living in San Diego who had commissioned her to be built in Taiwan—a Formosa 46, a 46-foot Peterson designed cutter rigged sloop with a center-cockpit. Cousin to the better known and more costly Peterson 44. We had invested so much more than money in her—our hopes and dreams, our safety and security, our hearth and home, our larger selves. She is what separated us from the sea on those long ocean voyages and moved us through the air by harnessing the wind. Deep in her belly she rocked and sung us to sleep. When the storms rose she sheltered us from the rain. When huge rogue waves came crashing down she lifted us up. When the wind died away and left us floundering in the middle of nowhere, she was the still center in a circle of blue. I cannot tell you the pleasure and affection I felt when we were ashore and looked out at her waiting patiently for our return. 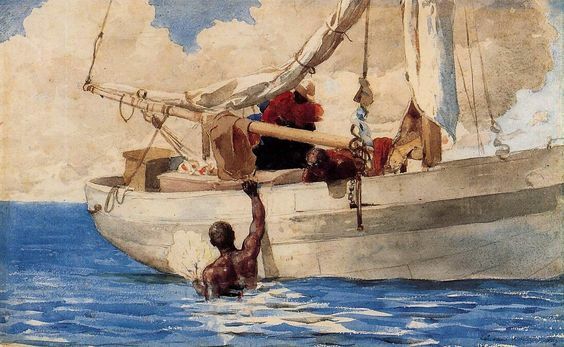 What it felt like to bring our dinghy aside her and hoist our provisions aboard. 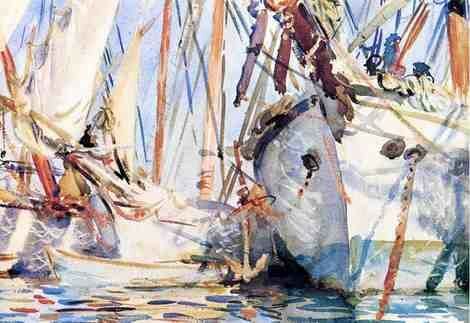 The thrill of weighing anchor and heading out to sea, raising her sails, watching them fill. Hunkered beneath her dodger during night watches, I listened to the rush of waves and sails in the black, black night, and watched her mast stirring stars. 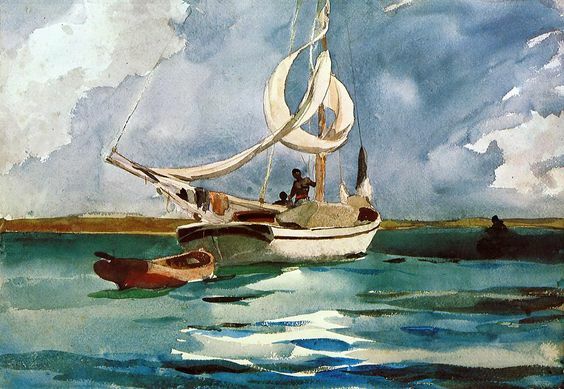 Sleeping below deck as she rocked with the waves, her rigging humming overhead, the soft gurgle of the ocean whispering through the hull, was sweetness like no other. I loved sunning my chilled skin on her warm teak decks after a long morning hunting and diving for scallops. Falling asleep in the cockpit on balmy days in port, watching the stars gently rock overhead as she rolled with the soft swells. How I miss her! But we carry her in our hearts and in our memories, in the words on these pages, and the novels I am writing. I like to think another family has taken over where we left off, hugging her close, and steering her on new adventures.